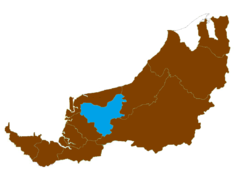 This article is about an administrative division in Sarawak, Malaysia. For the town, see Sibu. For the administrative district, see Sibu District. 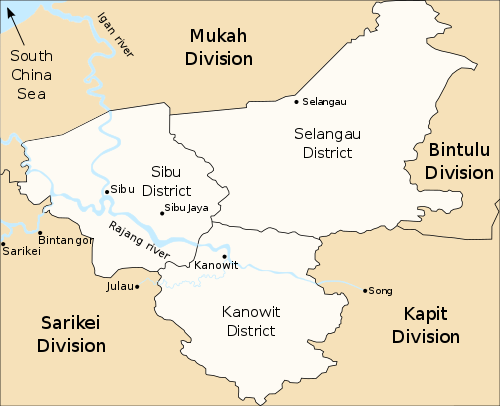 Sibu Division is one of the twelve administrative divisions of Sarawak, Malaysia. It has a total area of 8,278.3 square kilometres, and is the third largest division after Kapit Division and Miri Division. Before 1 June 1873, Sibu was known as "Maling", named after the winding portion, Tanjung Maling, on the other side of Rejang River. Maling was a small village with a few small and simple shop houses consisted of atap roof and wooden walls and floors. Main population was Malay and Chinese was minority. In 1841 "Sarawak" (the present Kuching - Sarawak capital) was ruled by 'White Rajah', James Brooke. [clarification needed] On 1 June 1873, the third division was created and the division was named after the native Rambutan because the division had a lot of native Rambutan known as "Buah Sibau" in Iban language. In 1901 Wong Nai Siong led the first batch of Foochows from China to Sibu to open up the fertile lands of Sibu for cultivation, a massive opening up of Sibu. Therefore, it was a landmark year or a milestone in the history of the development of Sibu. Wong Nai Siong came to Singapore in September 1899. From there, he proceeded to West Malaysia, Sumatra and the Dutch East Indies. For six months he explored the places but failed to find a suitable place for the immigration and settlement of his folks in China. In April 1900, Wong came to Sarawak and got the approval of the Sarawak Rajah to look for a suitable site for Chinese immigrants. Wong explored the lower valley and upper reaches of the Rejang River. He soon discovered that the Rejang Delta was very fertile and particularly suitable for cultivation. He decided to choose the area for opening up for cultivation. With that decision, Wong went to see the second Rajah of Sarawak, Rajah Charles Brooke, for discussions regarding the matter of opening up of land for cultivation. In those days of the Rajahs, Sarawak was sparsely populated with vast land yet to be developed, Wong's plan was timely and very much appreciated. When Wong went to see Sir Charles Brooke and explained to him his plan to lead large groups of Foochows to open up Sibu for cultivation, the Rajah immediately agreed. Both parties signed an agreement. The Chinese immigrants came in three batches. The first batch consisted of 72 people, the second batch 535, and the third batch 511, totalling 1118 people. Of the total, 130 brought their spouses and families, while the others were bachelors. After working in Sibu, nearly all the immigrants chose to settle down and made Sibu their new home. They were happy to settle down for a brighter future in Sibu. Wikimedia Commons has media related to Sibu.